Since the Hollingsworth and Harlan families have many connections, the Hollingsworth's would like any Harlan's to join them. For further information, please contact Susan Aggarwal at VNSAGG@aol.com. future. Time spent together in these locations can also change our lives. Bring your grandchildren and children to search for their family beginnings. The tour will be accompanied by Marjory Harlan Sgroi, a Harlan family member who has arranged four previous tours to examine that familys history -- which so mirrors our own. Come along on a truly unforgettable trip! This is departure day for the flight to Manchester for those not planning to arrive early in England. Price: $2895 per person, double occupancy, $425 single supplement. and will provide those forms. Participants: The maximum number of reservations to be accepted is 25. Luggage: Each traveler will be allowed one suitcase to be transported by coach, plus a carry-on bag that will fit under an airline seat and be handled by the traveler. and refreshments as described. Baggage tips and service charges which are included in hotel and restaurant bills and government taxes. sightseeing or other services than those specifically mentioned, items of a personal nature, excess baggage, optional gratuities to guides or hotel staffs. .
ASSOCIATES, Inc. ($750 for each reservation). There aren't any plans for Harlan tours at the moment. If you are interested in future tours, please contact me at 1-800-785-7785 or look us up at www.ashtondrye.com. 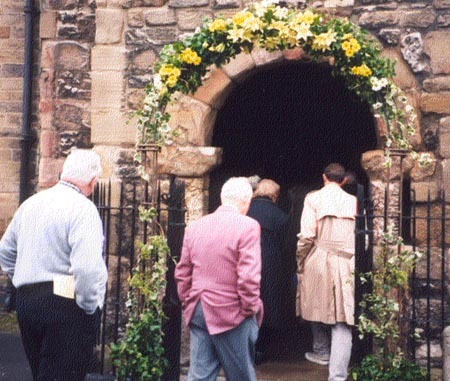 1998 Trip to Wales Welcome to the Harlan Tours Page. Over the past five years, the Harlans have taken three tours that included England, Northern Ireland, Scotland and Wales in search of the sites of our roots. We visited such highlights as St. Peter's Church in Monkwearmouth (site of the baptism of George), Sutton Hall outside of York with its nearby church, the Lurgan Meeting in Northern Ireland and the Harland Moors in Yorkshire.